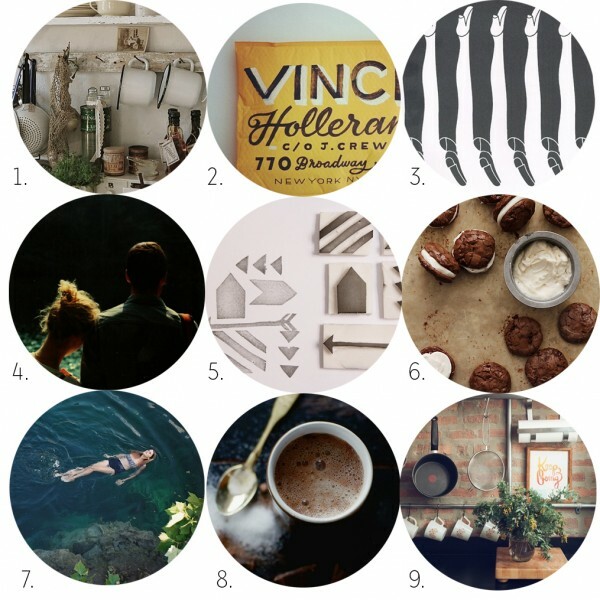 I don’t have a project this week, but that’s perfectly alright because I felt inclined to share some of my favorite pins lately over on Pinterest. The majority of the things I’ve been pinning as of late revolve around food I want to make, looks I adore that inspire my wardrobe, photographs that are beautiful, and any hand lettering goodness I find inspiring to my own craft, and stuff that my talented friends (and Internet friends, too!) are up to. I’ve heard people scoff at the “lack of creativity” of people using Pinterest, that they have to curate and reblog beacuse they can’t think of things of create things to make on their own. Yeesh! That’s crazy! I, for one, use it as a guide. Yeah, I’ve created things that are pretty similar to whatever initially inspired the project I’m making, but more often than not I’m putting my own twist on things. The thing about Pinterest is you can totally get swept away in going pin crazy, but it’s the next step, the action, that’s the key. I feel motivated to do, to make, to create, after I spend time looking through friends’ boards. I don’t know if there’s proof to back this up, you know, proper studies of the pinning habits of the masses…but I think the most actively creative people are the ones embracing Pinterest the most. It’s fun to use it as a visual cookbook (to actually cook/bake the food I pin! ), and to see the kind of inspiration others are having. It’s also incredibly interesting to see what seems to be trending, too. I’ve found countless blogs I know read regularly, and products that I’ve actually bought, after seeing them on Pinterest. But, you know what? If people are simply just pinning things and never doing a thing beyond that, whatever! Why are people all up in their business anyhow? I know there are so many pins of recipes and DIY projects that I’ve yet to tackle, and I certainly don’t see a problem there. Right? Right. Okay, I’m done. I’ve used the word ‘Pinterest’ in this post a bazillion times. I have canned five batches of the blueberry jam recipe that was Pinterest inspired. They’re so lovely that I can’t get myself to remove them from the kitchen counter, even though I could use the space. I completely agree! Sure, people use Pinterest in different ways, but my advice to the naysayers is to follow people with like-minds and let the creativity flow. It inspires me in so many different ways.